Haunted Collector is a reality show that deals with the paranormal. John Zaffis is a demonologist, someone who studies items or issues that relate to demons, the paranormal or the occult. Together with his team, Zaffis travels the United States searching for items which might possibly have a paranormal connection. John Zaffis and his team of paranormal investigators believe that certain objects, such as dolls, lamps, chairs, or other household items, can retain a paranormal aura and may even make paranormal activity, such as ghost or poltergeist activity, more likely to occur. This is usually because a spirit has formed an attachment to a certain object, or because an object was at one time around or used in paranormal or occult ceremonies. When Zaffis and his team first enter a location that seems to be experiencing paranormal activity, they do an entire sweep of the house, looking for anything natural that could be causing some of the odd occurrences. They also fully question the owners of the property and carefully review any claims of paranormal activity. Members of the team then research the property and any items that they think may be related to the paranormal activity. After completing their initial research, Zaffis and his team return to the property for a nighttime investigation. During this investigation, the team can get more of a feel for, and may even experience, some of the paranormal activity the client has claimed is happening. They can also look for certain objects that they believe may have a paranormal connection. Once Zaffis and his team discover what they believe to be the paranormal object, the object is brought to an expert, usually someone familiar with the particular type of antique. Zaffis learns as much as he can about the object and how it could have picked up the paranormal resonance. Zaffis then returns to his client and asks if they would prefer that he remove the object. Collected objects are then stored in Zaffis' personal haunted collection. The third season comes to a close with a visit to an antique shop in Florida that shares a commonality with John's museum. John makes a chilling discovery in a family's basement. The team also investigate a seminary that's allegedly haunted. John Zaffis and the crew fly to California to investigate a Hollywood Hills home once occupied by movie legend Orson Welles. John and his team investigate an inn in Arkansas and a castle in Missouri. The team investigates the claims of two female ghosts haunting a Missouri community center. John and his team investigate claims of aggressive paranormal activity made by visitors to Fort Wayne in Detroit. John and his team arrive at a bed-and-breakfast to investigate claims that the owner saw the apparition of a headless horseman. The team investigate the Emmitt House in Waverly, Ohio. Next up, they visit a home in Brighton, MI, with a terrifying past. John and the team visit Ponce de Leon's estate in Puerto Rico to investigate claims of disembodied apparitions. John Zaffis and his team visit an old Montana prison where the staff are stiff. Later, they check out a former brothel where renovations have come to a halt due to terrifying activity. The team investigate strange happenings at a Boston cigar bar and in a Victorian home in upstate New York. In the third season premiere, John Zaffis and his team head to Montgomery, New York to meet with horse farm owner Mary Lu. In the second-season finale, the team investigates claims of paranormal activity in Hawaii, including at the corporate event space on Lanai of the real-estate company Castle & Cooke and at the Iao Theater on Maui. A couple claim their 200-year-old Connecticut house is haunted and an ominous apparition of a man seems to be targeting their young twin daughters. The team then heads to Elizabethtown, Kentucky to investigate strange phenomena reported at the Morrison Masonic Lodge. A Connecticut home is investigated for claims of paranormal activity and unexplained fires. Apparition and poltergeist activity are checked out in a Kentucky museum. The team investigates paranormal activity at a historic tavern in Mississippi and the disturbing activity at a family home in Upstate, New York. Claims of paranormal acitivity in an 8-sided plantation/Civil War hospital-turned-museum in Kentucky are investigated. Claims of paranormal activity in a Las Vegas casino and a family's compound in Glendora, California, are investigated. Claims of paranormal activity in a newly renovated home in Lorain County, Ohio and at a book store in Tipp City, Ohio, are investigated. Claims of poltergeist activity is investigated at Pennsylvania's Grand Midway Hotel. The team investigates claims of paranormal activity in a Michigan home and a former asylum in Virginia. The team investigates claims of paranormal activity in New York and Virginia. The team investigates a New York bed-and-breakfast and a Florida home. The team investigates a woman's Kentucky home and a silo in Ohio in the second season premiere. Haunted Collector is currently available to watch and stream on Syfy. 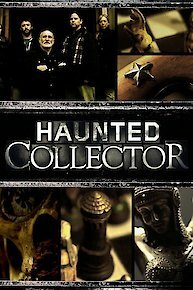 You can also buy, rent Haunted Collector on demand at Amazon, Vudu, Destination America, FandangoNow, Google Play, DIRECTV NOW, iTunes online.